The fun and blossoming pattern of this area rug for college girls makes it a creative-looking, cool rug to include with your college supplies. 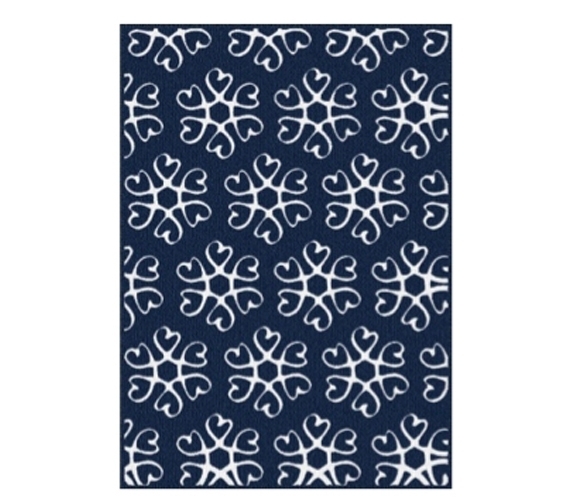 You'll have to include at least one rug for college as part of your dorm supplies, and the dark color and unique pattern of this Hearts Blossom Rug - Navy and White make it an interesting and ideal dorm item to bring some more dorm decor and comfort to your college room. Its floral yet heart-shaped designs mean it blends patterns to create its special look. So don't just settle for any college rug; choose one that will stand out! No matter what other dorm room decorations you included, a good, cheap rug can help to really tie your college decor together. Or, if you place this dorm room rug in the center of your dorm room, it can be the centerpiece of your dorm decorations and you can even decorate your dorm around it! Either way, college rugs are versatile dorm products. And since cheap rugs won't set you back too much, they can be regarded even more as dorm essentials!